Luxury event venue and art gallery located on the Upper East Side on 80th between Lexington and 3rd. Saturday: Tour Reservations Only: 12pm, 2pm, and 4pm. To reserve your visit to the Waterfall Mansion & Gallery, please reserve through http://www.waterfall-gallery.com/tours/. 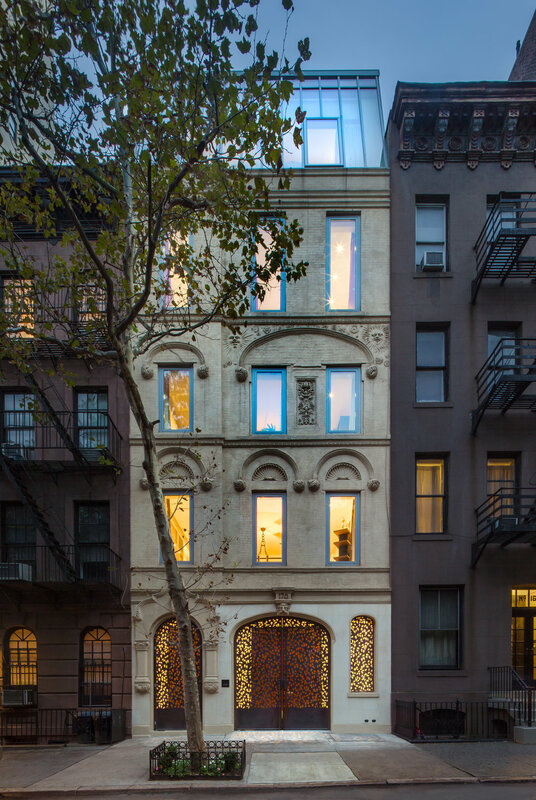 Located in the heart of the Upper East Side, the Waterfall Mansion & Gallery is a unique space that reflects the flexibility and innovations of modern lifestyle. Before the being converted into the contemporary art gallery it is today, 170 E 80th Street was home to Leslie and D.D. Tillett, two of the most influential textile designers of the postwar era. Their prints were associated with the likes of Claire McCardell and Jacqueline Kennedy. For two generations, the Tillett family artisans and craftsmen used the carriage house as both a residence and a studio since the 40's. In honor of the heritage of the property, Waterfall owner and founder Kate Shin designed the facade directly from a painting of the original building and retained the concept that art and life exist simultaneously and harmoniously. The home was designed to be a state of the art modern gallery with a twist. With five floors including a professional grade kitchen, spacious terrace, and rooftop with a skyline view, every area of the house was designed to house prolific contemporary artworks in the context of a high-end modern home. The purpose of the Waterfall Mansion & Gallery is to serve as a vessel for creativity and luxury. A truly unique space which invites one-of-a-kind experiences. In addition to serving as a hub for contemporary and international art, the Waterfall has hosted events for the top names of a wide range of industries including Christie’s Auctions, Gucci, Remy, Rolls Royce, Kedar Entertainment, Swatch Group, Shiseido, Clé de Peau, Beauté, FENDI, SONY, the United Nations, and the Caterpillar Foundation. By providing a unique blend of art, luxury, and culture, the Waterfall Mansion has proven to be a private venue of its own kind. Situated in the cultural center that is the Upper East Side, the Waterfall Mansion is walking distance away from city landmarks such as Central Park and the Metropolitan Museum of Art. The Mansion was built to contribute to the lively cultural scene of the city while offering a truly extraordinary experience for its visitors. To contrast the bustling activity of Manhattan, the interior of the Waterfall is designed to provide an intimate and tranquil environment. Each room is thoughtfully curated with Sculpture, Paintings, Photography, Mixed Media, Installations, Ceramics, and Video Arts. The adaptable space is unique yet versatile and has accommodated many different styles of exhibitions and events. It consists of six floors with nine rooms, 8.5 bathrooms and an elevator. Developed by Kate Shin and designed by world renowned architect Toshiko Mori, the townhouse's layout introduces abundant space and incorporates the elements of nature and Feng Shui. The design prioritizes beauty and balance while also keeping environmental sustainability as a pivotal foundation. The Waterfall Mansion & Gallery is a LEED Silver certified eco-friendly space constructed with green design elements including naturally sourced and environmentally sustainable materials. The sleek and airy design featuring high ceilings and skylights allows for natural sunlight to light the majority of the space in the daytime and includes an HVAC system that maximizes indoor environmental quality. At the heart of the gallery, the indoor waterfall for which the mansion was named, stands 22 feet tall. Founder Kate Shin added this feature as a personal note as each of her childhood homes in Korea prior to immigrating to the United States included a waterfall. The waterfall serves as a symbol of home and the flow of life as well as a serene focal point for any event.